IIMS 2018 kembali akan diselenggarakan pada tanggal 19 29 April 2018 di JIExpo Kemayoran dengan penggunaan total area sebesar 100.000 m2. INDUSTRY.co.id - Jakarta - Indonesia Automotive Exhibition International Motor Show (IIMS) 2018 will be held again on 19-29 April 2018 at JIExpo Kemayoran future. In addition followed by four-wheel brand, two wheels, and the presence of activists from the aftermarket industry in Indonesia, IIMS 2018 also appear more vibrant through a series of interesting programs. Being at Center Piece Of Carni IIMS 2018 comes more complete through a variety of activities. Not only the unique building that became the main menu, Center Piece Of Carni is equipped by IIMS Lounge, Trick Art, IIMS Bar & Café, Barber Shop, Unique Car Garage, IIMS Library, and IIMS Merchandise. "This year's Center Piece of Carni looks more attractive and accommodates digital lifestyle. Visitors can enjoy various dishes such as Trick Art through 3D photos. Visitors can also see some cars in Unique Car Garage. Even visitors who want to refresh the appearance, we are accommodated with the presence of Barber Shop. 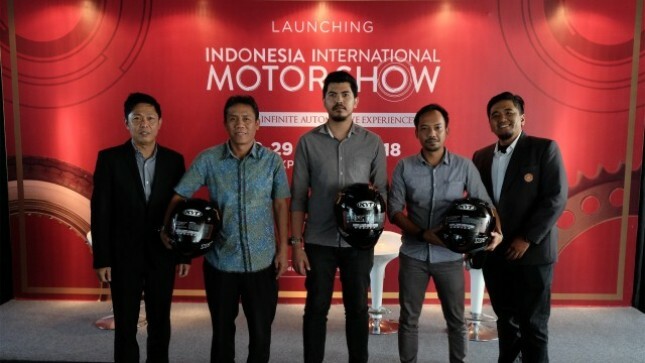 Or for visitors who want to collect the official merchandise IIMS 2018, can buy it at the booth IIMS Merchandise ", said Hendra Noor Saleh, Project Director IIMS. One of the activities that always awaited visitors is IIMS Test Drive & Ride. This year's testing area is designed to be more attractive and is followed by all car and motor products participating in IIMS 2018. IIMS Test Drive & Ride more complete with the presence of Electric Car Festival, which will feature electric cars owned by APM and electric cars produced by Indonesian students. The existence of Electric Car Festival is a series of IIMS Pride Of Indonesia as a form of support IIMS 2018 to target 400,000 electric cars in 2025 which proclaimed by the government. The concept of IIMS 2018 which combines several automotive elements in the country is reflected in several other excellent programs, namely IIMS Sunmori which will be done on every Sunday, and IIMS Indonesia Auto Modified (IAM) which will bring dozens of best modified cars in Indonesia, along with dozens of HIN Girl. The next flagship program is El Toro Loco in the IIMS Wheel Of Giant area. Monster Truck with a body and large tires will be present during the implementation of IIMS 2018 and visitors can get close to enjoy the figure of El Toro Loco imported directly from the United States.